Hayward Universal Heater Efficiency. Performance. Innovation. Presenting Hayward®'s world-class Universal pool heater with an Earth-friendly conscience…the Hayward Universal H-Series heater! While all Hayward H-Series heaters are energy-efficient, the Universal pool heater H-Series Low NOx heater has an 83-84 percent industry-leading thermal efficiency and complies with all current California and Texas air quality emission standards. The low NOx emission makes it a perfect choice for the environmentally concerned pool owner. NOTE: Hayward Universal H-Series heaters meet the NOx emission standards set by the California South Coast Quality Air Management Commission for 2001 and the Texas Natural Resource Conservation Commission Code. 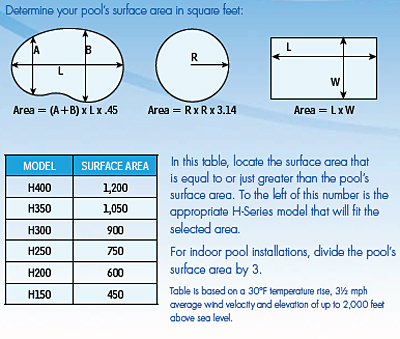 Enjoy a warmer pool this season without your fuel costs skyrocketing. 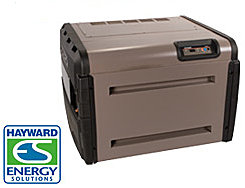 Hayward Universal Heater H-Series represent innovative heating technology for pools and spas. Its hydraulic performance also saves energy by reducing the circulation time of the pump. It can raise the temperature of an 800 gallon pool 30 degrees in less than an hour—you'll feel the benefits the moment you step into the water. This approach to heating your pool is an efficient use of energy—showing once again our commitment to developing earth-friendly products. Additionally, the Hayward Universal Pool Heater H-Series is easy to install and combines advanced technology with universal-fit flexibility making it virtually compatible with any new or existing equipment pad. This heating mixture sustains your swimming season, adds to your comfort, is energy efficient, and reduces your fuel costs. This low NOx emissions heater is perfect for you and the environment—all at the same time. Superior Hydraulic Performance - New polymer header provides superior hydraulic performance to save energy and protect against the damaging effects of erosion from high flow conditions for improved reliability. Designed for today’s larger diameter plumbing systems with 2" x 2 1/2" CPVC unions. Forced Draft System - Forced draft system constantly moves air through the combustion chamber at a precise flow rate, eliminating all outside weather variables that can effect the heating performance, such as high wind conditions — without a high wind stack. State-of-the-Art Finn Plate Heat Exchanger with Cupro Nickel - Our patented single header "V" baffle design heat exchangers allow for long life, fast heating and virtually no condensation. All Hayward heat exchangers are now constructed with highly resilient Cupro Nickel for greater durability and longevity even in salt-based, high flow or aggressive water chemistry set ups. L.E.D. Control Panel - Easy-to-read L.E.D. Control Panel provides digital temperature readout and diagnostics for quick identification of components that might need service. 1 year manufacture warranty. Please refer to owner manual for details.